What shall we think about today? Something fun I think. I wonder…You have just been given an infinite amount of money, what would you do with it? Then I would focus on donating to charities for *Autism/Aspergers, GLBT, **EDS, children, literacy, books for children-hospitals-libraries, Shriners, and probably a dozen others I can’t think of right this minute. 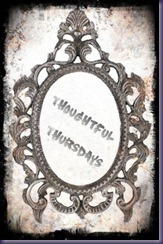 Thoughtful Thursdays is a meme hosted by better Read Than Dead Each. Thursday I will post a question for you to ponder. Feel free to join in the fun by either posting your answer in a comment, or by stealing my cute little picture and placing it on your blog! Tell your friends and lets make this fun. If you could be any character in any book, movie, or TV show – who would you be? And why? Make your decision on how you feel at the moment you see this question. I know I change my mind everyday. Right now I’d have to say Buttercup from Princess Bride. Who wouldn’t want to find true love, have hot guys at your beck and call, and get to have the hottest kiss in history? I’ve never loved how weak she is but I just love the fact that Westley goes through all that, including being mostly dead, to get back to his true love. . . Buttercup. If you are a new follower and have a blog, be sure to leave me a comment so I can return the favor.